Robert Duvall as Eisenhower gives his usual riveting performance. The late Lee Remick gives a good performance as Captain Kay Summersby, the British driver/secretary assigned to Eisenhower. Unfortunately the miniseries centers around the relationship of Eisenhower and Summersby, a relationship which is subject to historical dispute. Tom Selleck gives a very good portrayal of Eisenhower in the days leading up to D-Day. The video does a first rate job of portraying the problems that Eisenhower confronted: getting prima donnas like Montgomery and Patton to work as a part of a team, concerns about the weather, the deception campaign to convince the Nazis that Calais would be the invasion site, etc. The video also shines a light on the weight of responsibility which Eisenhower bore, especially when we see him write out a note just before the invasion taking full responsibility on his shoulders if it failed. The epic miniseries covering the exploits of Easy Company, 506th Parachute Infantry Regiment, 101st Airborne, captures well the chaos of the parachute and glider operations behind German lines that were so critical a part of the Allied victory on D-Day. No movie does a better job of conveying the chaos and murderous fire that the initial assault troops at Omaha Beach were exposed to than Saving Private Ryan. The rest of the film is so, so in my estimation, but the opening sequence on Omaha Beach is the closest to the grisly reality of combat of any film depiction. Richard Todd playing Major John Howard who took the two bridges between Bénouville and Ranville. Todd had taken part in the actual seizure of the two bridges as a Captain, another actor playing him in the film. 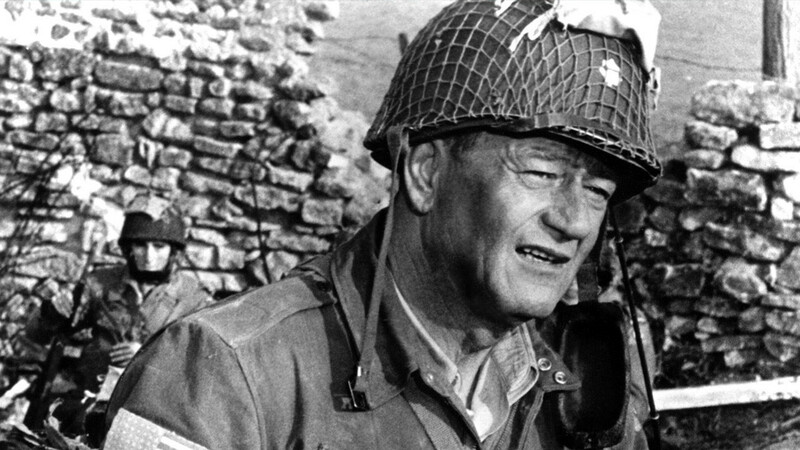 A surly John Wayne as Colonel Benjamin Vandervoort, demonstrating both the confusion of the Airborne landings and the stubborn determination of the 101st and 82nd to take their objectives. Wayne was too old for the role at 55, Vandervoort being all of 27 at the time, but he was utterly convincing. He would die of a massive heart attack on July 12, 1944. Robert Mitchum as Major General Norman Cota, assistant divisional commander of the 29th Infantry who did so much to rally troops on Omaha Beach. A colorized version of the film has been produced, as demonstrated by the video at the beginning of the post, but I prefer the black and white version which hearkens back to the World War II films and newsreels. Anyone who hasn’t seen this film needs to remedy that omission as soon as possible. 6th on the list: D-Day — the Sixth of June trailer. At least I’m assuming it didn’t make the cut, not that you forgot about it.